Square’s lack of profitability in core processing is not because it is sub-scale but because the micro-merchant segment that it serves is structurally unprofitable given high turnover and fraud; this is reflected in the fact that Square has seen no operating leverage in processing since 2013 despite more than doubling volumes (Chart 1). The firm is therefore looking to cross-sell business services (such as analytics, marketing support, and invoice-factoring) to increase revenue/seller (in effect treating processing as a loss-leader for micro-merchants) and to march up-market to serve larger merchants. Chart 1: Where is the Operating Leverage in Processing for Square? There is early evidence of success in both approaches as software sales were >$20mm in 2015H2 versus less than $3mm a year-ago, and relatively large merchants (>$500k in annual card purchases) are now 11% of Square’s volumes versus near-zero four years ago. 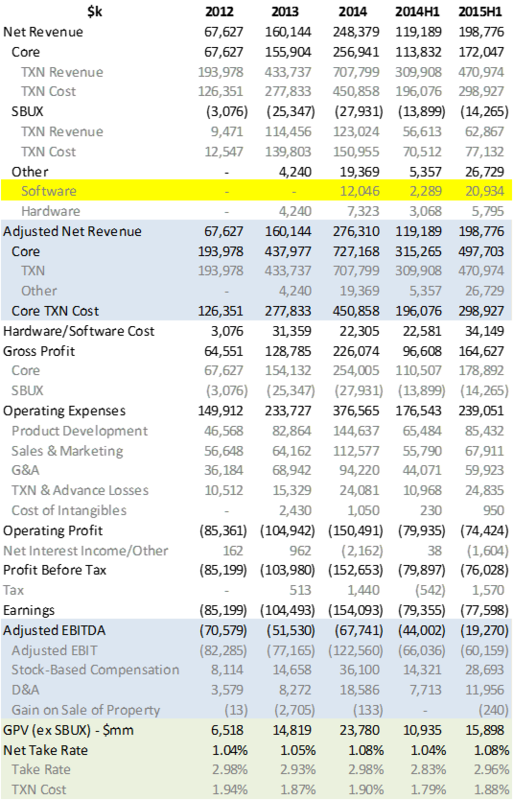 However, we view these results as green shoots rather than model validation: software sales remain only ~10% of Square’s adjusted revenue and annualized volumes with relatively large merchants are $3-4bn compared with over $400bn at, say, FDC. 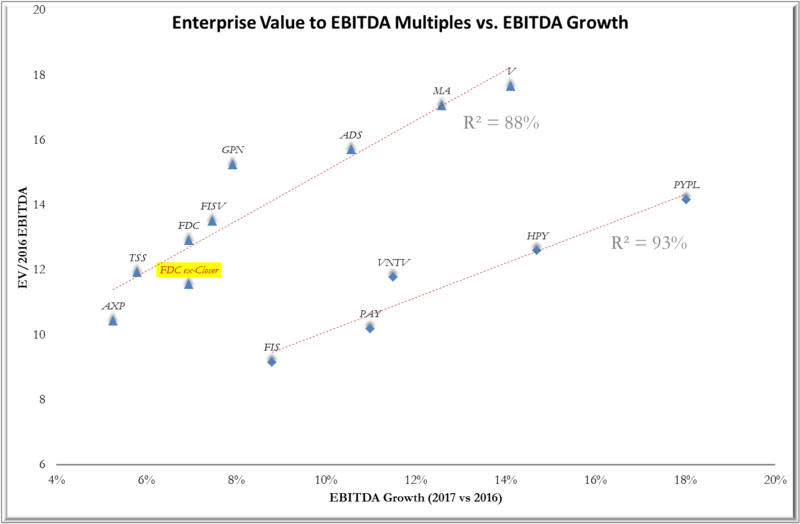 Indeed, if Square is worth $4bn, then so is FDC’s Clover business (which offers similar hardware and software to small merchants) meaning that FDC’s mainstream business is available at an interesting multiple (Chart 2) and we prefer it (Chart 3). The broader issue for industry structure, and hence Square’s vertical integration of software services and card-processing, is that we believe that all but micro-merchants will prefer a gateway solution that allows them to offer-out processing contracts independently of point-of-sale software rather than be captive to Square processing as in the case of Square Invoice and Square Store. In short, we agree with Paul Galant, CEO of PAY, when he says the best point-of-sale terminals are “connected through a secure commerce architecture where everything is encrypted that touches it, pushes it to a gateway, and that gateway pushes it to the acquirer [processor] and makes a connection to whatever is going on online”. On its face, the $4bn valuation for Square (9x expected 2015 revenue of $450mm growing at 50%) does not seem unreasonable (compared to, say, ~6x paid in May 2014 by VNTV for Mercury growing at 17%). However, Mercury generated an EBITDA margin of just under 40% while Square’s EBITDA is negative. Furthermore, Square will not easily scale into profitability because card-processing in its core segment of micro-merchants (i.e. those with less than $50k in annual card volume) is unprofitable given turnover and fraud; indeed, this is why the segment is not served by already-scaled incumbents. In 2015H1, for example, 63% of Square’s adjusted (i.e. 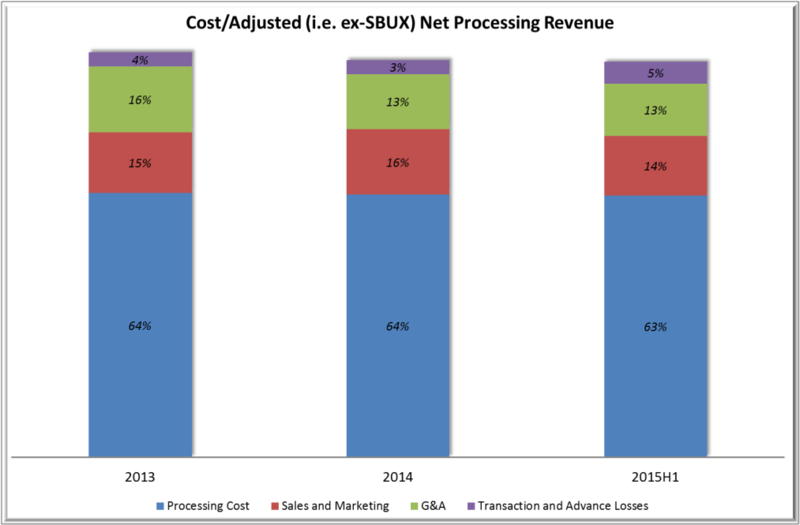 ex-Starbucks) core transaction revenue was absorbed by fees to the payments system and 33% by costs-of-business (marketing, fraud, and administrative but excluding product development). These percentages are largely unchanged from 2013 so there is no apparent operating leverage in processing (Chart 1 above). Differentiation: Square is looking to differentiate in the micro-merchant segment by treating core processing as a loss-leader and bundling in software services (including business analytics, marketing support, and factoring/financing) but the resulting revenue stream, while growing rapidly, is small (~$20mm in 2015H1 – see Appendix). The model may work given Square has a brand advantage over competing independent software vendors (ISVs), such as Mercury, and there may be a consolidation play in a fragmented market but we would rather own First Data which combines, through Clover station (graphic above), an app-based ecosystem for small-business-services along with a scaled platform for card-processing. 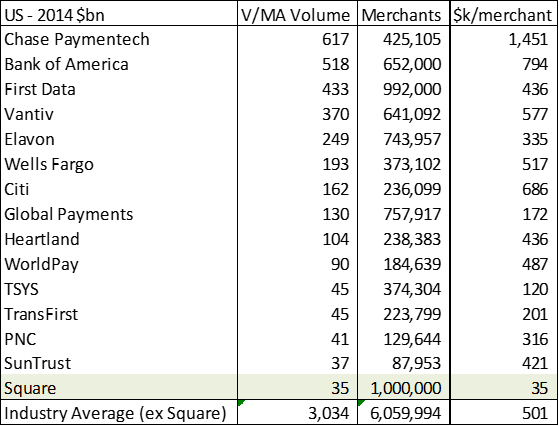 This scaled platform is available at an interesting multiple if Square, and hence Clover, is worth $4bn (Chart 2 above). March up-market: While the average card volume of Square merchants was ~$35k in 2013 (versus ~$500k for the industry excluding Square – Chart 3 below), Square is moving up-market: in 2015Q2, 63% of processing was for merchants with <$125k in annual volume down from 92% in 2011Q2 and 11% of processing was for merchants with >$500k in annual volume from near-zero in 2011Q2. Square argues that “unburdened by legacy systems” it can provide differentiated services but, in fact, it runs its processing over the same legacy infrastructure as everyone else; the differentiation is in ease-of-onboarding including relief from payment-card-industry or “PCI” certification (because, like PYPL, Square is a PSP) and the price-bundling of business-management services with core card-processing. However, for all but micro-merchants, it is worth investing in standalone PCI compliance to reduce per-transaction fees and working with a gateway so as to be able to bid-out processing contracts across multiple vendors and de-linking processing from point-of-sale software.